1. bag – proenza schouler, 9.525 kr. 2. book – how to be a parisian, 200 kr. 3. polo – comme des garcons x play, 1.100 kr. 4. pants – stine goya, 1.800 kr. 5. boots – givenchy, 9.700 kr. 6. bath and bodyshower – kiehl’s, 200 kr. 7. sweatshirt – 3.1 phillip lim, 2.960 kr. 8. denim shirt – acne, 1.600 kr. 9. bracelet – rebekkarebekka, 1.200 kr. 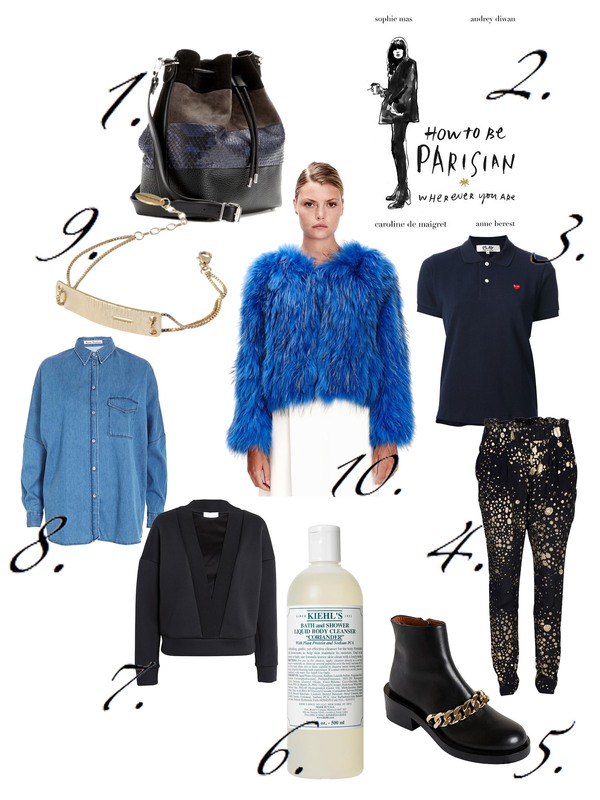 10. fur coat – saks potts, 6.495 kr.